Laundry is super easy, right? Right?! Okay, maybe not. BUT, there are a few ways to make it bearable and almost-easy. First, I’m just going to say, unless you just want to hire out your laundry, there is no method of getting the laundry clean and put away without going through the steps of cleaning it and putting it away. I feel the need to say this, because sometimes people ask me how to organize laundry, and I can tell by their response to my answer that they were hoping for some magical system. If you are a unicorn chaser, throw glitter at the computer screen to help you focus, but keep reading: you need to hear this. What is true about kids clothes is true about all of it. You don’t need to own so much if you take care of it regularly. So do that. A Laundry Schedule helps you make sure you are taking care of everything regularly. This image shows all the different loads I do. I keep this up in my laundry room and cross off as I go. Here is where I show how to do that. Now you know what day you’re going to do the laundry, what next? Now you need to decide on your plan of attack for getting to the laundry each day. Once you know your plan of attack and you repeat it week after week, it starts to become a habit. You have to push past the first 3 weeks when it is hardest. Set routines like you start a load of towels after your kids bathe a certain night each week or you clean your cleaning cloths after you clean your bathrooms. Fold kitchen towels while dinner cooks. Whatever works for your life, get into a groove with it! I love folding laundry while I unwind in front of the TV a bit each day. Make laundry a reward. These two systems solve all of our clothes-washing issues. Both the following posts are must-reads. This is my routine/system for My Kid’s Laundry. This is my routine/system for My Husband’s and My Laundry. Small loads or loads that all get put away in the same place is one of my biggest tricks. I do the white towels in my master bedroom separately from the towels in the other bathrooms. That way, I wash it, dry it, fold it, and then put it all away in the same place. No sorting! I apply that same principle to all of my laundry. If you take my links above about how I do my laundry and my kids laundry, you will see how I don’t really like sorting. Excepting my hampers/systems for clothes, I have this in my kitchen for dirty kitchen cloths, a hamper in each bathroom that has a tub/shower for towels, and one in the laundry room for cleaning towels. I also keep a little lingerie bag hung on the back of the doorknob in my laundry room for little socks I find all over the house. Each hamper gets washed and then put back in one place. This makes a big difference!! One of my favorite little loads is my kitchen cloths. You can read more about that system HERE. As a busy homemaker, the last thing you want to do is waste your time with inferior laundry products. See my favorites HERE. One of my favorite uses for a timer is changing over the load of laundry from the washer to the dryer. (You know, so the washer doesn’t start to smell.) My washing machine supposedly dings, but I never seem close enough to hear it. I used to do the kitchen counter, but lately I just use the handy timer on my phone. Be sure to use the timer for your dryer cycle too. If you get the clothes put away right away, that is so much easier! If you let it pile up, you are setting yourself up for disaster. Don’t do it! Don’t let it pile up!! I’m down to one laundry basket I keep in my laundry room. This forces me to empty it out before I fill it again. This is really helping!! Oh man, I can actually hear some of you cringing from across cyber-space. Hey, I can’t do it all! I know these tips can be a lot to take in, but give them a try to see if things get a bit better for you. Success really is in the follow-through, because when you keep going at this and it DOES BECOME A ROUTINE, life really is so much easier. Give laundry some limits and boundaries. 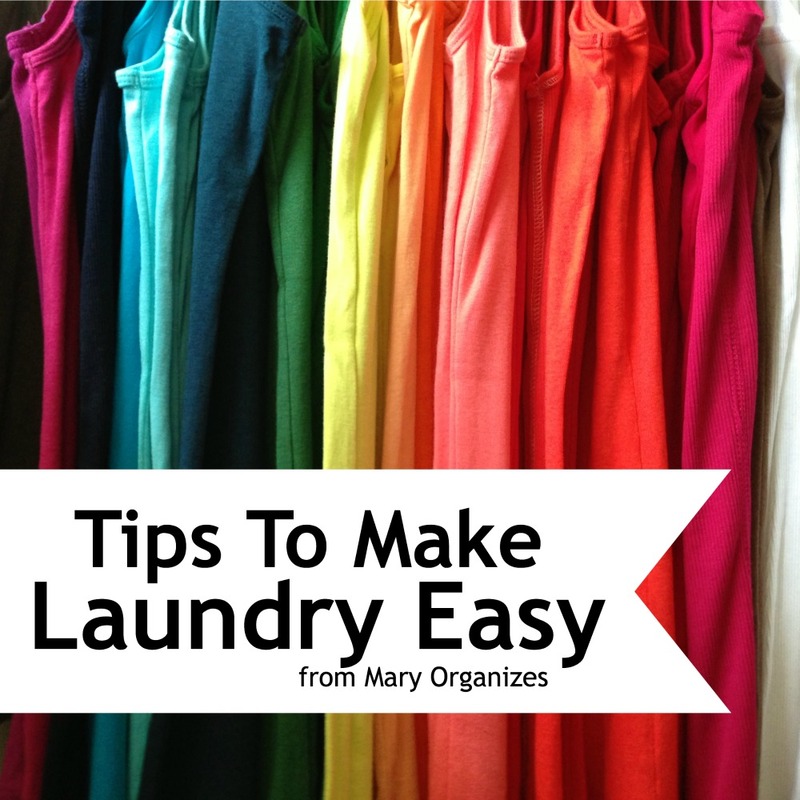 Do it when it’s time, and don’t let laundry haunt you anymore. Imagine a weekend without laundry? That future is yours! I really am trying to make your life easier – I hope this helps. Hi, Mary! I love your website and facebook page! I’m really enjoying reading everything you’ve written. As for laundry, I have two questions. What if you’re NOT swimming in kids clothes but the opposite? I don’t think my kids have enough clothes to make it for a week (they only have one or two pairs of pajamas, for example)? And do you let your dirty kitchen cloths dry first before putting them in their bucket? If I waited a week, I feel like they’d smell, and most of the time, when I wash them after that point, they still have a smell to them out of the drier. I usually boil all my cloths if they get a smell to make sure they’re sanitized, but that’s a serious amount of work! Any ideas? Tori, that is probably a personal decision. If your way is working for you, don’t fix something that isn’t broke. If it would work better for your kids to have 1 week worth of clothes, then you may have some shopping to do. There is no one right way, I just give suggestions. If you do the bucket in the kitchen, you have to play with it until it works for you. For me, if I let the wet one dry a bit, it all works out okay. I wash mine on Sanitize and will sometimes add in a drop of Basic G to give it a good sanitizing. I agree with your idea of setting up a laundry routine and our sorting system is quite similar. However, for me a small loads policy seems to be VERY environmental unfriendly: waste of water&energy etc. The idea of “no sorting” is tempting but I couldn’t bring it together with my little need for being “green” aka economical. My “small loads” policy is open to interpretation. I have a family of 6, so doing all the bath towels isn’t really a small load. 🙂 I could maybe better explain it by saying I believe in “specific” loads, though I wouldn’t force a load to grow large before washing it. Then, you run into other problems, like having to buy more clothes and towels for your family. And then, really, there might not be that huge of a difference even. For instance, I could sort my kids clothes into 3-4 different piles, or just wash each child’s independently in 4 loads. That is really just spreading the same amount of washing out in a different way, that is so much easier on the human, work-efficient end. I actually consider myself a very “green” person. I put my money where my mouth is, I use laundry detergents that aren’t just green by a fad term, they are the real deal, actually won’t hurt the environment kind of green. I recycle. I try not to waste. I support people not getting a whole bunch of extra freebie/junk that just fills landfills. I do not think me promoting the idea of regular washing and getting on a wash schedule is a detriment to the environment, or I would not have felt comfortable suggesting it. If you read my post about the different adult laundry bags, I actually say how NOW I feel like I can wait until there is a decent amount to wash that it is all split up. When it was all bunched together, I felt the need to wash the tiny loads each week just so I didn’t have to put it back in the big hamper again. Hopefully, anyone that follows that suggestion actually helps people save lots of energy. To make sure I answer your original question and didn’t get too far off, I think that my method of not sorting saves human energy, mechanical energy, and even money. If saving money and going green is important to you with your cleaners, I would whole-heartedly recommend Shaklee products. I just started your system about 3 weeks ago. Before, everything went in ONE hamper and I would wash it when full. It drove me CRAZY going all over the house putting stuff away and folding 300 different piles of clothes. I still don’t love laundry but your system has saved a big chunk of my sanity. Thank you! Yay! Success!! Thanks so much for sharing!! OK…I’ve never thought about scheduling a specific day for a specific type of laundry….this is inspiring! I always try to wash every day but never know where to start. I have began sorting clothing by laundry basket…SO much help. Hopefully with this lil tip I will be on my way to keeping up with the laundry! Thanks! I struggle with the laundry situation in my house on a daily basis. There are 4 boys (one is the hubby) and me…I currently have 5 baskets of folded clothes waiting to be put away as well as one overflowing basket waiting to be folded AND another in the dryer! Now, you’d think we’d all be running around naked right now, but we all have plenty of clothing…so maybe I need to work on weeding out the unnecessary clothing and donate it/garage sale it. I am so glad I found this blog – lots of great ideas but now I just need to figure out where to start! Start at step 1! Or maybe start at de-cluttering your clothes. Clothes are like toys (or most things), it is so much easier to take care of less!! Where do I find step 1 please? I am so with you on the sorting issue. If I can put everything away in one room, it’s no big deal. My dryer has a steel drum and doesn’t require dryer sheets at all. It is awesome! I had used balls before then, but was happy to simplify it even more. Thanks for your suggestion, though, I hope it helps anyone else looking to cut out dryer sheets! That sounds like a dream! My biggest tip for laundry is that I don’t keep a laundry basket in my laundry room or anywhere else anymore. I always had piles of clean, folded clothes in my laundry room, in several laundry baskets piled ridiculously high that I was too lazy to put away. Laundry would start toppling over when we looked for things and the job of putting things away was just overwhelming. I removed the laundry basket. Now I wash and fold/hang straight out of the dryer (just like I did before) but since there isn’t anywhere to keep the folded laundry, I take it straight to where it needs to go and put it right away. I also have 2 hooks that will hold about 5-7 hanging items apiece. Things come straight out of the dryer, get hung up, placed on the hook and, because I haven’t left myself a huge place for hanging clothes, I take these immediately to the appropriate closet and put them away. I gave myself some self imposed boundaries or space limits and it has worked wonders. I have not had one pile of clean laundry waiting to be put away in almost 2 years! Finding something that works for you is the most important thing. Good job! 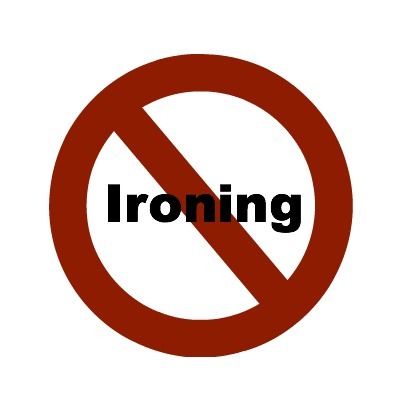 One of my best Lenten resolutions was to avoid Facebook until the laundry of the day was washed, dried, folded, and put away (or in the kid’s room who needed to put it away). Post Easter I eventually fell off track, but no time like the present to give it another shot!